After a simple breakfast in Bao Lac, we keep riding motorbike along the Gam river on the up and down mountain passes crossing some rustic villages with the colorful local kids standing on the roadside waving their hands. 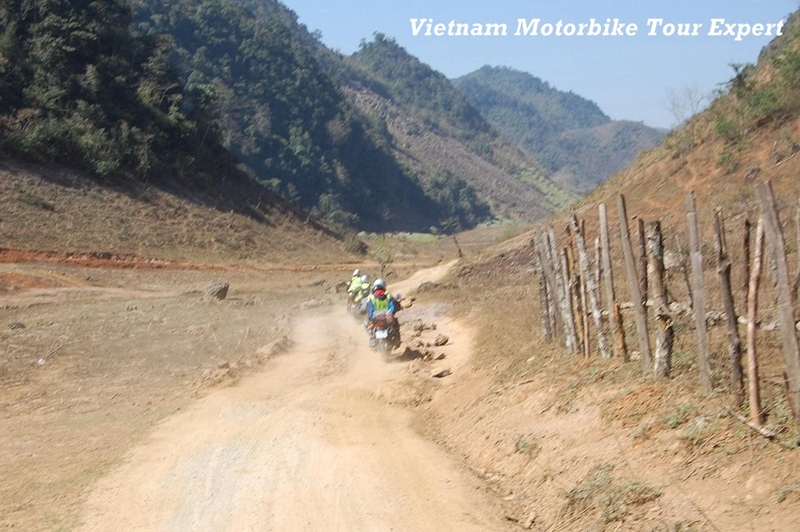 Just one hour riding motorbike on the smooth road then we’ll make a turn to rugged roads then starting a great off-road motorbike ride in Vietnam. The road is mostly bumpy crossing through some nice terrace fields, peaceful villages and some streams. 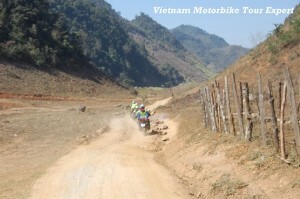 This must be one of the best off-road motorcycle tour North Vietnam. We’ll be in Ba Be lake at around 3:00 pm, leave the bikes at the village of the Tay people who live closely to the lake then spend a short boat tour on the largest natural lake in Vietnam – Ba Be lake. Home stay with the Tay people. After breakfast with the Tay family, we keep motorbike touring in north Vietnam to the largest man-made lake in Vietnam – Thac Ba lake. 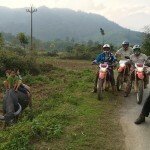 The motorbike ride to Thac Ba lake today is easier than the days before, the road is quite smooth and flat crossing some rice paddies and green large tea fields. It’s short but quite enjoyable motorbike tour with interesting info from the experienced tour guide of Vietnam Motorbike Tour Expert about the Indochina and Vietnam war when we do stopping at the Tan Trao and Dinh Hoa ATK, especially in the afternoon, when we arrive at Thac Ba lake we’ll have another short boat ride around the another “Halong bay on mountain” – Thac Ba lake with thousands of islands. 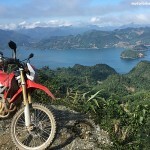 This could be the highlight of this 11 day motorcycle tour North Vietnam. Home stay with the Dzao people.